After leaving Florence our final destination was Venice but first we stopped off in Verona for a couple of hours. In my opinion, a day is more than enough time to devote to this city. The most popular attraction seemed to be the legendary balcony of Juliet from Shakespeare’s famous novel Romeo and Juliet. 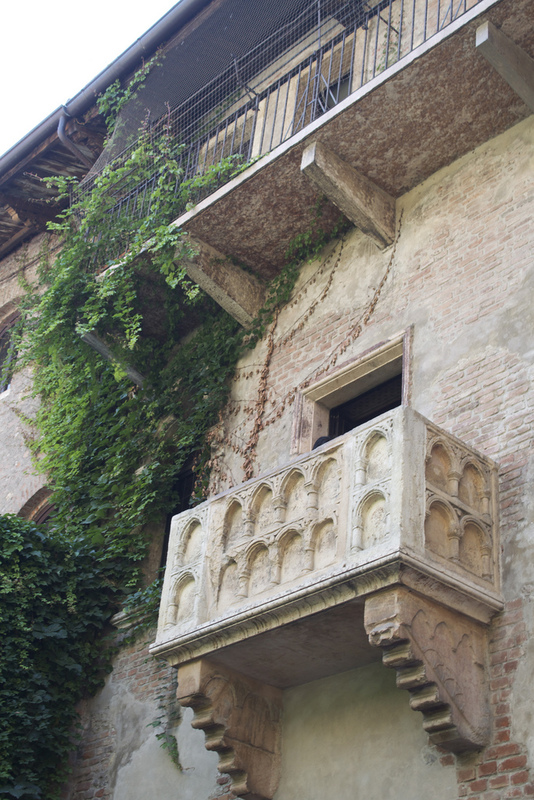 The home is believed to have belonged to Juliet’s family, the Capulet’s, with the balcony being the spot that Juliet stood as Romeo declared his love for her. What is believed to be the famous balcony of Juliet Capulet. You walk through a small walkway that is covered in graffiti with declarations of love from past visitors. There is a lot of romance radiating from this small courtyard with couples kissing and posing for pictures. A small, bronze statue of Juliet stands front and center and it is believed that love will come to those who stroke her right breast. This of course causes lines of people waiting to take a picture in this pose. 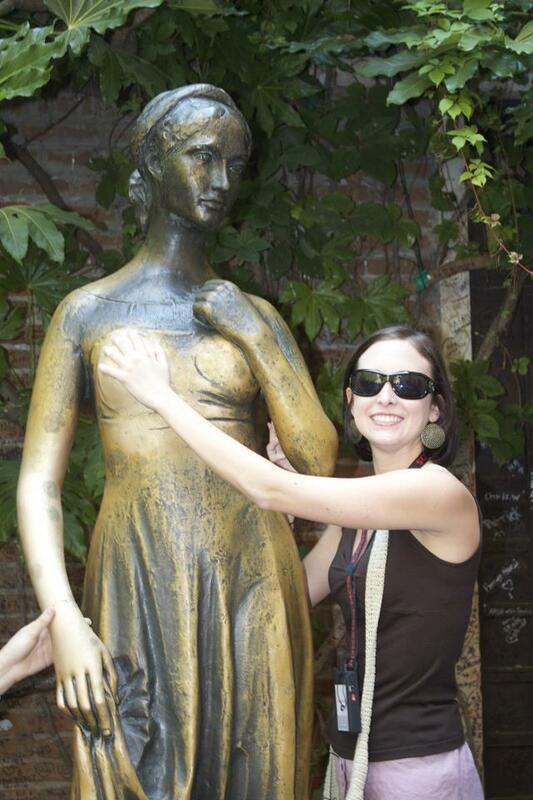 Stacy stroking Juliet’s right breast for good luck. Verona is very small yet diverse. 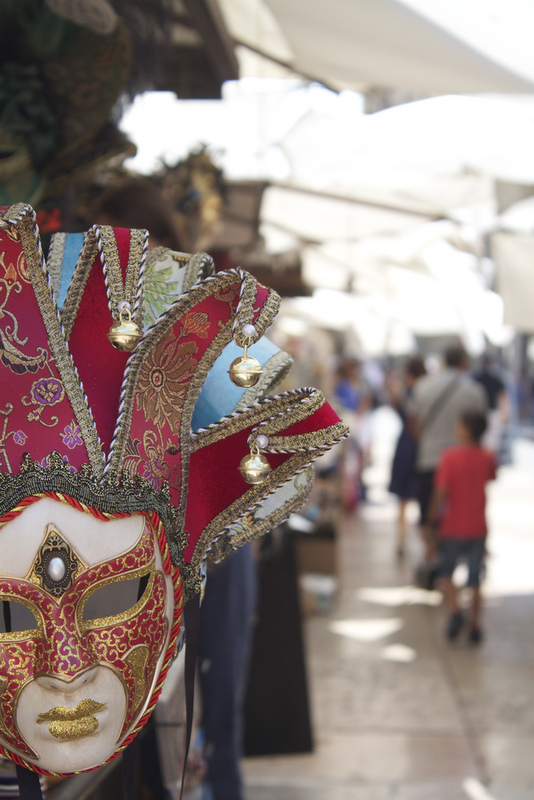 Quaint squares and markets are dotted among high-end shops and specialty stores. Sometimes I felt I was in a small village town while others I could have easily been on Rodeo Drive in Los Angeles. Here you will also find the Verona Arena which is the third largest colosseum in Italy. While it was closed during our visit just standing in its presence put me at awe. If I ever return, a performance at this arena will be a must see. That night we got our first glimpse of Venice. The reflection of the moon on the canals was a “pinch me” moment. 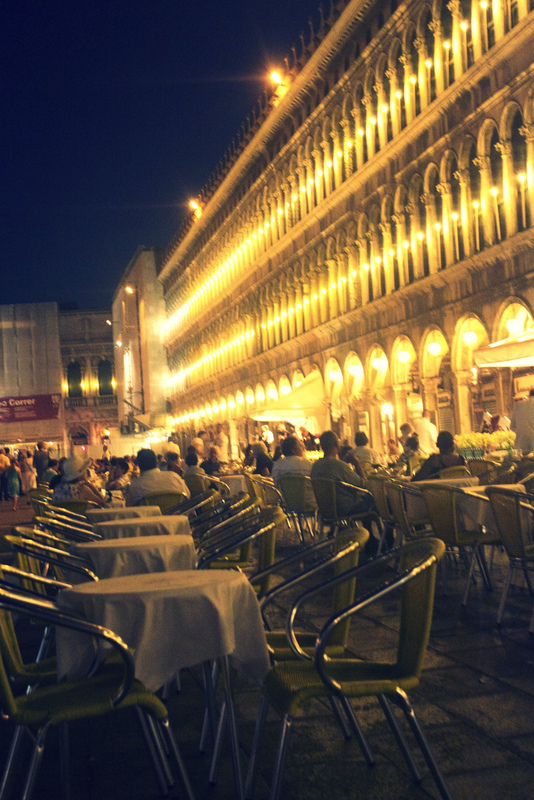 I still fondly of St. Mark’s square lit up and bursting with people enjoying a drink along the sidewalk cafes. A cafe in St. Mark’s Square in Venice. We stayed at Hotel Poppi which was a very nice, modern hotel. It wasn’t it the heart of Venice but a small bus ride followed by a boat ride down the Grand Canal put us right where we wanted to be. Here’s some advice for anyone that is considering visiting Venice: If you don’t have to go in August then don’t. It was ridiculously hot and being surrounded by water only makes things worse. Also, air conditioning is virtually non-existent. Stacy and I dipped into a small shop that advertised Air Conditioning and I paid 12 Euro for a Coke (a very small Coke I might add). I still debate with myself whether that 20 minute luxury was worth it. Weather aside, Venice was amazing. I had always dreamed of taking a Gondola ride and was fortunate to share the experience with Stacy and a very nice family from our group. If I remember correctly, the cost for a 40 minute ride was 100 Euro and was split with 6 people. Very reasonable for a one-in-a-lifetime opportunity. 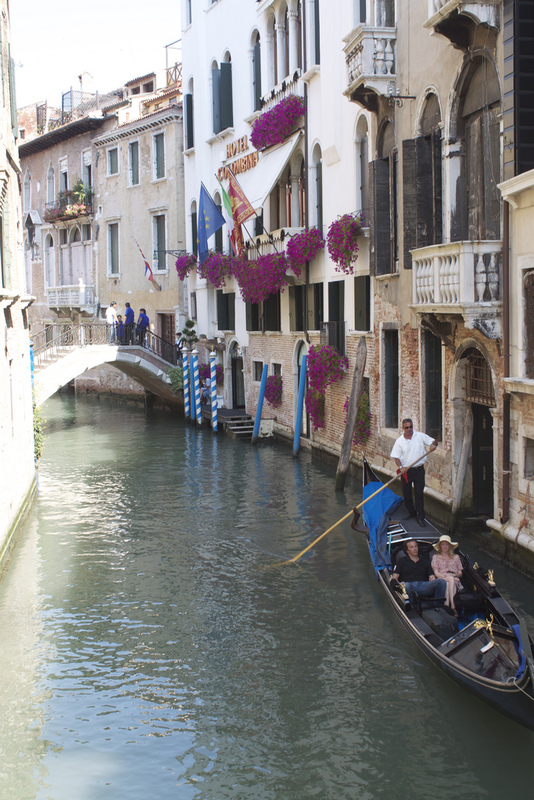 I immediately forgot about the heat as I enjoyed waving to fellow tourists and watching my gondolier maneuver through seemingly impossible spaces. If you ever find yourself in Venice, make sure you also take a ferry down the Grand Canal so you can ogle at all the extravagant vessels docked along the harbor. This is the only place I have ever seen a yacht with a helicopter docked on the deck. As our last night in Italy I was sad to leave a country that I so wanted to see more of. The plan was for Stacy to fall in love with and marry a hot Italian so I’d always have a place to stay. Alas, that plan fell through but I shall return one day. lot until the wee hours of the night.